Inspiration – the application of ideas and methods from economics to politics. Approach – models and deductive reasoning. It creates models of the world based on a small number of propositions and a logical examination of their connections. 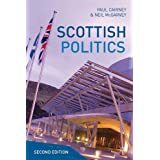 Aim – to establish how many, or what proportion of, political outcomes one can explain with reference to the choices of individuals under particular conditions. We can also identify two main types. The first is the abstract work which often involves building models or creating discussions based on openly unrealistic assumptions – for example, people have perfect information and judgement; they can act ‘optimally’ when faced with any situation. ‘Optimally’ is potentially misleading, since it refers to an ability to fulfil their individual preferences, by ranking them in order and being able to fulfil them. It does not necessarily refer to an optimal overall outcome, because things get complicated when many individuals, each seeking to fulfil their preferences, interact. 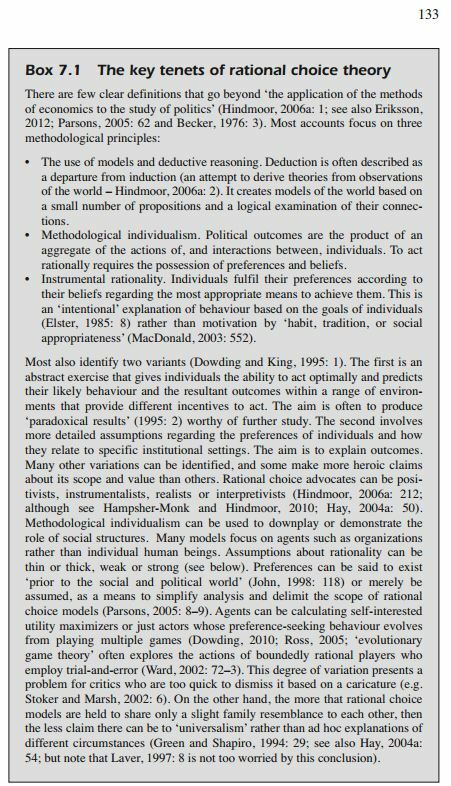 We should also note that ‘rational’ refers to the ability to reason and act on reason (crucially, we do not have to assume that rational beings are selfish beings). The second type involves more detailed and/ or realistic assumptions regarding the preferences of individuals and how they relate to specific institutional settings. In this case, the aim is to help explain outcomes. the paradox of non-voting, in which we wonder why people vote when their individual vote makes a minimal difference. the ‘free rider’ problem, in which we wonder why people would engage in collective group activity if they can benefit without engaging. the ‘prisoner’s dilemma’, in which we demonstrate that two people making choices to satisfy their individual first preferences are worse off than if they cooperate to secure their second best preferences. the ‘tragedy of the commons’, in which we demonstrate the potentially catastrophic, cumulative effect of individual choices regarding scarce ‘common pool resources’ such as fertile land, unpolluted water, clean air, and fishing stocks. The identification of such ‘collective action problems’ prompts us to consider the role of government and public policy in solving them. For example, we may identify ‘public goods’ to justify the role of the state as a supplement to, or replacement for, the market. Public goods are ‘non-excludable’ (no-one can be excluded from enjoying their benefits) and ‘non-rival’ (their use by one person does not diminish their value to another). Common examples, based on the argument that the state must intervene when the market would fail, regard national defence (the government should tax its citizens and businesses and provide national security) and clean air (the government should use a range of policy instruments to discourage pollution or encourage non-pollution). To what extent should the state replace the market? Since state action generally involves a degree of coercion (including taxation and regulation), it is important to consider how appropriate each intervention is, and how it might compare to solutions based on trust within particular groups, non-state incentives, or private mechanisms to ensure cooperation. Will state action improve collective outcomes? There is large body of ‘social choice theory’ which exists to demonstrate that the state cannot produce any rule that would make all of its citizens better off. Rather, it must consider how possible and appropriate it is to produce winners and losers, and if the winners can compensate others for their losses. What are the unintended consequences to government action? 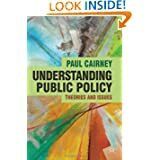 There is also a literature arguing that the state can make things worse: public servants acting in their own, not the public’s interest; interest groups and businesses encouraged to waste a lot of resources securing government privileges; and, governments manipulating economic cycles to influence their election chances. 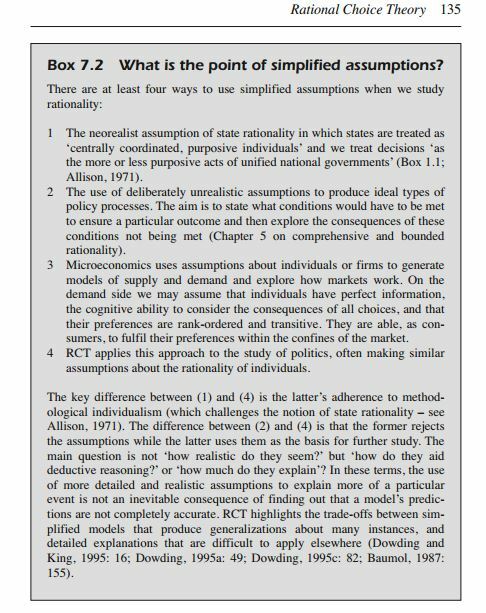 Indeed, rational choice presents us with a way in which to justify a role for government, or to argue for a minimal role for the state, in favour of the market. The work of Elinor Ostrom and colleagues presents a third option. 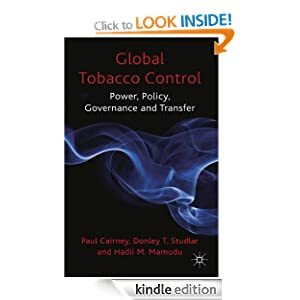 Ostrom’s work demonstrates the potential for non-market solutions to collective action problems based on a combination of trust and less impositional means (than government institutions), to minimize the costs of monitoring and enforcing collective agreements. This approach involves individuals seeking agreements with each other that could be enshrined in a set of meaningful rules (which is what we now think of as an institution). The rules may be enforced by a private rather than state authority – the ‘commons’ would remain common and actors would observe each other’s behaviour and report rule-breaking to the third party that everyone pays for and agrees to respect. For Ostrom, the theoretical aim was to identify the conditions that have to be met for some groups to organize themselves to solve a collective action problem without state coercion, while the empirical aim was to identify concrete examples of this process. This approach has proved to be influential, winning Ostrom the Nobel Prize for economics in 2009 and demonstrating the direct policy relevance of institutional rational choice analysis (often now called the Institutional Analysis and Development Framework, IAD). *here is how that section appears in the book (without the Harvard referencing removed).